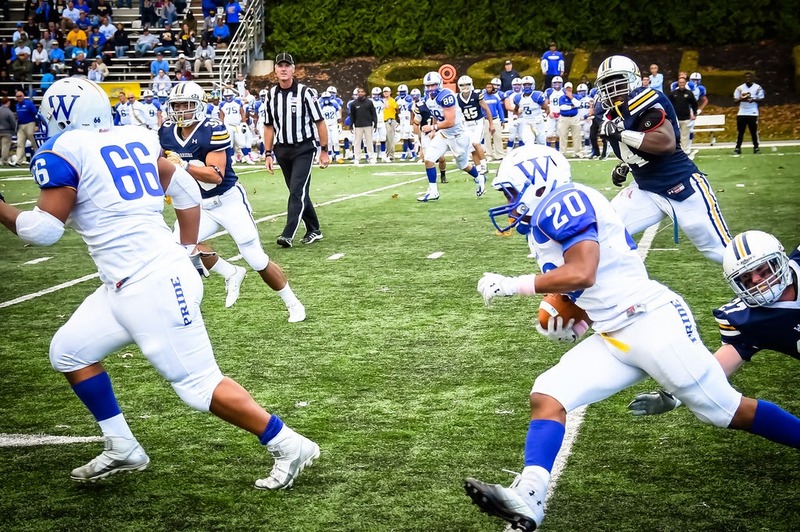 ANNVILLE, Pa. (Football) – The American Football Coaches Association (AFCA) released its week-six AFCA Division III Coaches' Poll on Monday with Widener and Delaware Valley continuing to move up after remaining undefeated. Widener (7-0, 6-0 MAC) moved up one spot to No. 12 in the country after a 34-17 win at Lycoming on Saturday. Lycoming, who fell out of the rankings three weeks ago, were receiving votes prior to Saturday's game. Delaware Valley (7-0, 6-0 MAC) jumped three more spots to No. 18 after a 41-7 win over Misericordia on Saturday. The Pride and the Aggies meet in the last week of the regular season on Saturday, Nov. 15 in Chester, Pa. Before the last weekend of regular-season action, Widener hosts Stevenson and travels to King's. Delaware Valley travels to King's and then hosts Fairleigh Dickinson-Florham. In other national rankings, both Widener (No. 12) and Delaware Valley (No. 21) moved up one spot in the D3Football.com Division II poll. Week nine of the 2014 MAC football season is this Saturday, Nov. 1 with five matchups. See schedule here.